This is for those who think that Agile is a recent evolutionary advance in software engineering. It is not. Before the 1990s, a great many - perhaps most? - software projects were executed in a non-waterfall way. Some were agile, some were not. In the 1980s I was fortunate to have been on many that were: projects with a servant leader, with full automated regression testing run daily, with test results displayed from a database, with a backlog of small demonstrable features, with co-location (individual offices side by side), with daily sharing of issues, with collaborative and evolutionary design, and with a sustainable pace. I can recall personally writing up to 1000 lines of tested C code in a day on my Sun Unix "pizzabox" workstation: those projects were highly productive - today's tools and methodologies do not exceed that productivity. However, over time more and more large software projects came to be managed by administrative program managers and procurement managers who had never personally developed software, and they foolishly applied a procurement approach that is appropriate for commodities - but not for custom built software. This was motivated by a desire to tightly control costs and hold vendors accountable. Waterfall provided the perfect model for these projects: the up-front requirements could be done first and then serve as the basis for a fixed cost, fixed schedule "procurement" involving the implementation phases. This was a horrible failure. Software people knew in the 1960s that this approach could not work. 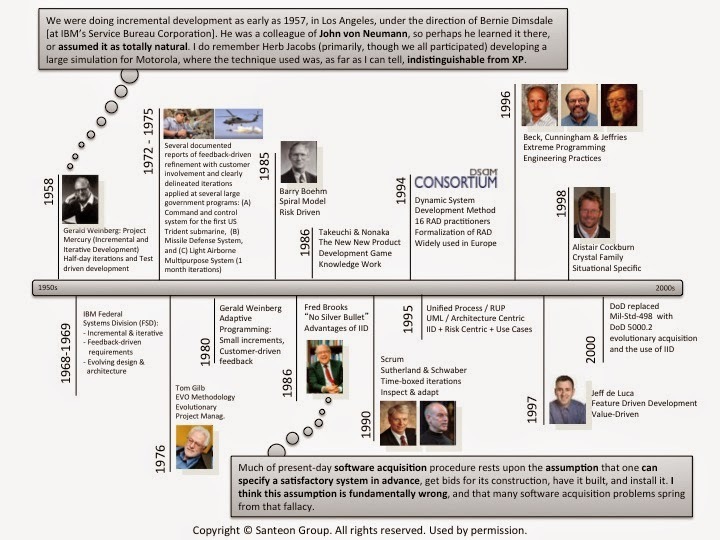 So in the late 1990s a movement finally came together to push back on the trend of more and more waterfall projects, by returning to what had worked before: iterative development of demonstrable features by small teams, and a rejection of communication primarily by documents. This basic approach took many forms, as shown by the chart. And that is why I am against "prescriptive Agile" - that is, following a template or rule book (such as Scrum) for how to do Agile. There are many, many ways to do Agile, and the right way depends on the situation! And first and foremost, Agile is about thinking and applying contextual judgment - not "following a plan"! And then you have young people come along, their software engineering experience dating no farther back than 1990, and they claim that Agile is a breakthrough and that the "prior waterfall approach" is wrong. Well, it was always wrong - people who actually wrote code always knew that waterfall was idiotic. There is nothing new there. And Agile is not new. So when an Agile newbie tells a seasoned developer that he/she should use Scrum, or that he/she is not doing Agile the right way, it demonstrates tremendous naiveté. People who developed software long before the Agile Manifesto during the '70s and '80s know the real Agile: they know what really matters and what really makes a project agile (lowercase "a") and successful - regardless which "ceremonies" you do, regardless of which roles you have on a team, etc. It turns out that most of those ceremonies don't matter: what matters the most - by far - is the personalities, leadership styles, and knowledge. This chart was developed by a colleague at a company that I worked at, Santeon. The information in the graphic was taken from an article by Craig Larman. Here is the article.